Alternative Men's Diamond Wedding Ring : LOVE2HAVE in the UK! Here we have featured a men's diamond wedding ring and what we consider to be a real alternative when it comes to choosing a diamond wedding ring for men. In fact, we would not only class this wedding ring as an alternative ring but a luxury one too. 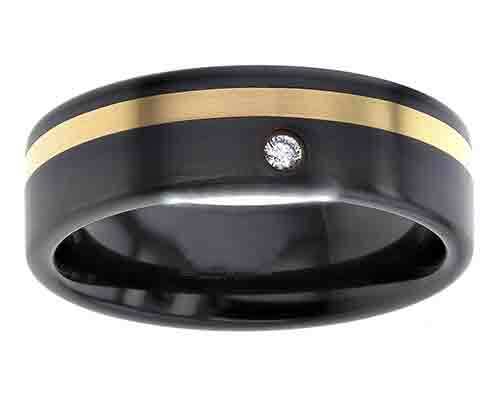 It is a flat profile wedding ring with an 18ct yellow gold inlay worked flush into the zirconium band. Like all the black zirconium rings on our site, the colour is created using industrial heating techniques to create a vibrant dark surface. As pictured, the gold inlay sits slightly off centre towards one edge, and its width is 1.5mm. The 3pt white diamond that sparkles is again set flush into the surface contrasting beautifully with the black zirconium. Precious stone(s) Available: 1 x 3pt white diamond. Metal(s)/Material(s) Available: Zirconium and 18ct yellow gold. Returns Policy: This item is made to order so, therefore, non-returnable unless faulty or not as described. Please see our terms and conditions.